After several years spent testing wireless charging stations in some of its Boston and San Francisco locations, Starbucks is expected to announce plans today for a nationwide rollout of the technology that allows for easy charging of smartphones and other compatible devices. This means Starbucks customers across the US will soon be able to charge their mobile device for free simply by plunking it on a table or counter containing the charging technology – all while merrily gulping down their Caramel Flan Frappuccino. In the coming year the coffee chain plans to introduce charging stations in all of its San Francisco locations before installing them in its outlets across the nation, the Wall Street Journal reported Thursday. 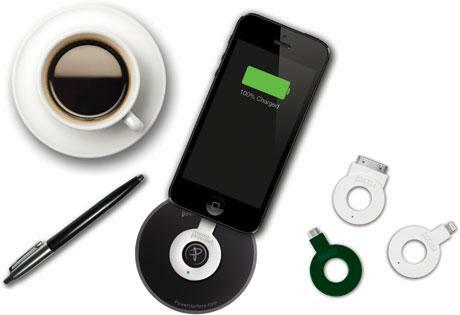 One issue, of course, is that not many folk have devices capable of charging wirelessly, but the company providing Starbucks’ charging spots, Israel-based Powermat, is hoping that with the coffee giant’s backing, its technology finally has a real chance of going mainstream. For those without compatible devices, the company suggests using its AccessCase – a $30 charging case for some Samsung and iPhone handsets that’ll work with Starbucks’ charging spots. It also offers a ring that you can plug into a handset to perform the same function. Another factor which has hindered the widespread take-up of wireless charging technology is that several companies are competing for their solution to become the industry standard. Because of this, mobile manufacturers have been reluctant to commit to implementing the technology for fear of choosing the one that ends up losing the battle and fading from view. The Power Matters Alliance (PMA) – founded by Powermat and Proctor & Gamble’s Duracell unit three years ago – has been competing with the Wireless Power Consortium (WPC) and its Qi system in a bid to become the industry standard. Although PMA has more than 100 members – including big names such as Samsung, Sony, and Toshiba – Powermat’s technology is yet to find its way into a significant number of devices. On that front, WPC has been doing better, with the Nexus 5, LG’s G3 and some Nokia phones, to name a few, incorporating the Qi technology. However, Powermat’s Starbucks deal is certainly an important step in PMA’s ambition to become the technology of choice for manufacturers. As for Starbucks, it’ll be hoping that its plan for a nationwide rollout will provide smartphone-using coffee fans with an extra incentive to step into one of its stores and part with their cash.